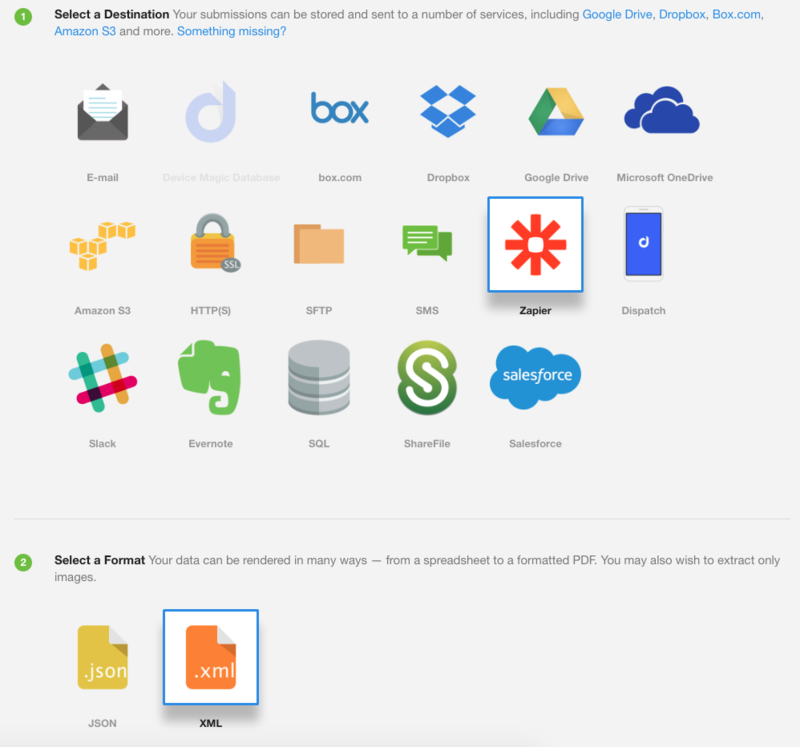 Zapier is yet another Destination to which you can send your forms! For those who are unfamiliar with it, Zapier is a way to easily transfer data between different apps. Now you can transfer Device Magic data between your different apps, too. 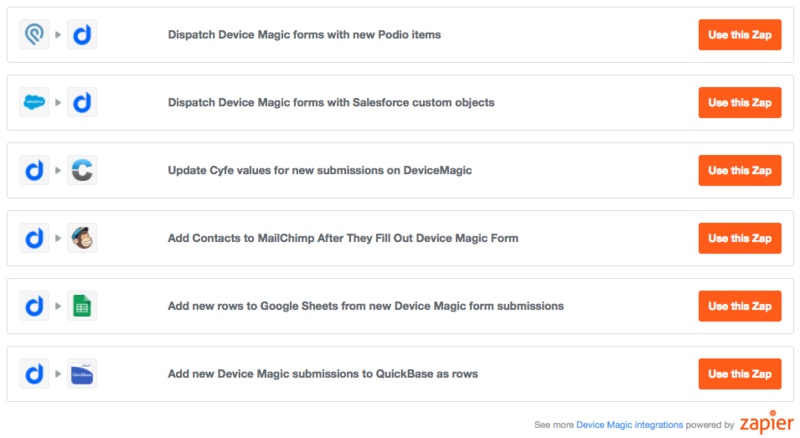 Zapier also pairs with a number of Analytics and Dashboard platforms to further analyze your Device Magic data. 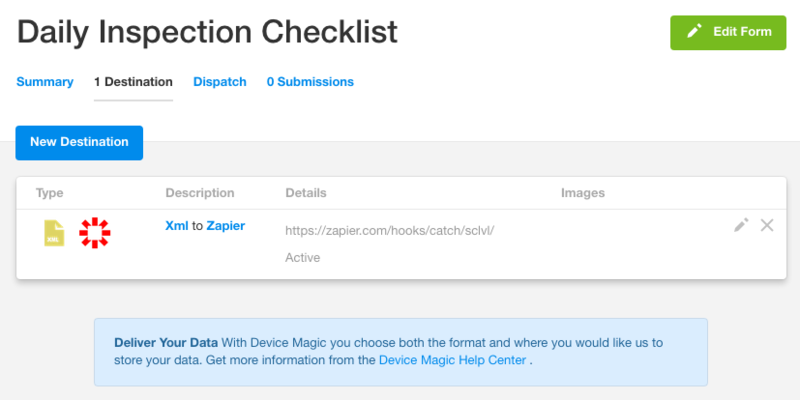 This tutorial will show you how to set up your Device Magic Zapier Destination (which has to be done via setting up a Device Magic Zapier Trigger). Keep reading to learn more about how to do this (or, alternatively, you can click here for our video). To start, you will have to create a Zapier account. Once you have logged in, you will be taken to the Zapier dashboard. To the right, you will see the "Make a New Zap" button. 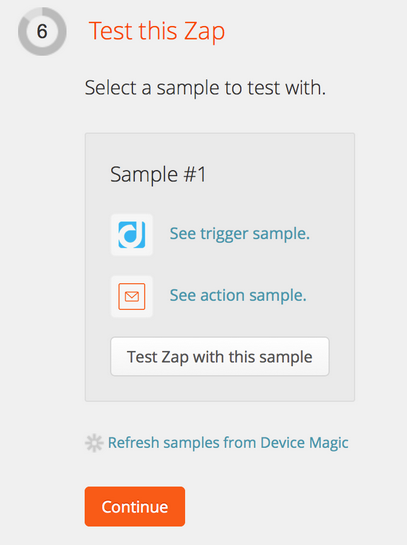 Click this to get started with making your Device Magic Zapier Trigger. The next page on which you will find yourself is the "Create New Zap" page. Here you can create and edit your zaps. Open the drop-down menu that says "Choose a Trigger app..." and select "Device Magic". Another drop-down menu will appear beneath it. Open it, and click on the option that says "New Submission". Then on the right, open the drop-down menu and select an "Action app". After you have selected one (in this example, "Email" has been chosen), another drop-down menu will appear beneath the "Choose an Action app..." drop-down menu on the right. Open this one, and select an action (in this example, "Send Outbound Email" has been chosen). Just beneath the drop-down menus, you will see the "Continue" button. Click it. You will now be taken to Step 2. To complete Step 2, you will need to open a new browser window or tab and log in to your Device Magic account. Once you've done that, go to your "Forms" page and click the link in the destinations column of the form you would like to add the destination to. Select Zapier as your destination and choose the XML delivery format. Upon selecting Zapier as your destination, you will be directed to the bottom of the page where you will be asked for a Zapier Webhook URL. Go back to the Zapier tab and you will find this under Step 2. Copy and Paste it into the space provided on the Device Magic page, in Step 6. In Step 3, you will be given the option to save any images, signatures or sketches to another service. In Step 5, you will be able to download a sample XML. Step 6 is where your Zapier Webhook URL should be pasted. Step 7 will give you Binary Device Magic options. It can be set to "Public" or "Private". Destination Rules will give you the opportunity to stipulate rules for when it should deliver. 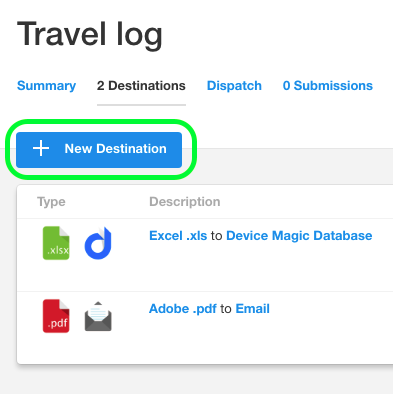 You will then be directed to the Destinations page for your form where you will see the Destinations you've made for it - now including the Zapier one you have created. You will need to go back to the Zapier page to finish creating the trigger. Go there now. Continue on through the steps (they're pretty straight forward) and you'll get to Step 5. Here is where you will fill in the details that outline the email and how it will look once received. "To" can be filled in with your email address or the address of the person to whom you want the email sent. "Subject" is straight forward, too, and can be filled in with anything from the name of the form to your own personal subject. When it comes to the Body of the email, you can insert the different form fields. Click "Insert fields". At this point, the Zapier Wizard will pop up. 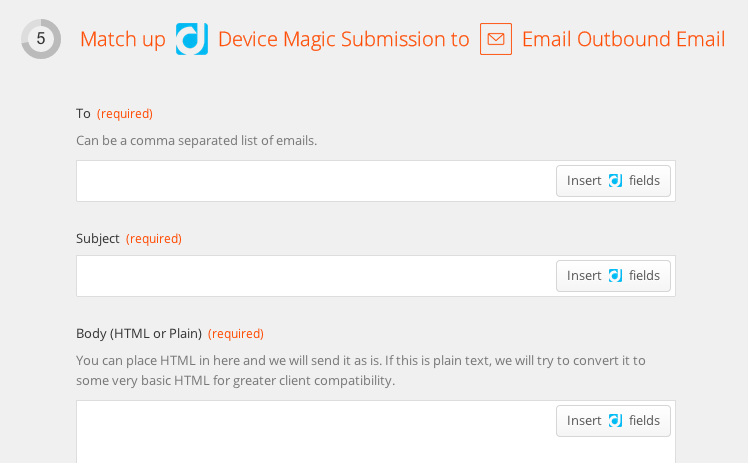 Since the Device Magic form fields change from form to form, this wizard asks for a few things so it can confirm what form fields are going to be needed in the Body section of the email. You have already done step 1 in the Zapier Wizard, so click on "Ok, I did this". Next, you will be required to create a new form submission. Once you've done this, click on the next "Ok, I did this". Once the submission has been received, click "All done!" Step 6 asks you to test the Zap you've created, after which you can continue on to the last step. Lastly (Step 7), you will be asked to name the app. Once that has been done, click "Turn Zap on" and you will then see your newly made Zap sitting on your Zapier Dashboard. And you're done. Your new Zapier Destination has been created and is ready to receive submissions! If you haven't checked out our instructional video yet, do so now by clicking here. This concludes our walkthrough of adding the Zapier Destination. If you have any questions or comments feel free to send us a message at support@devicemagic.com or leave us a comment below.